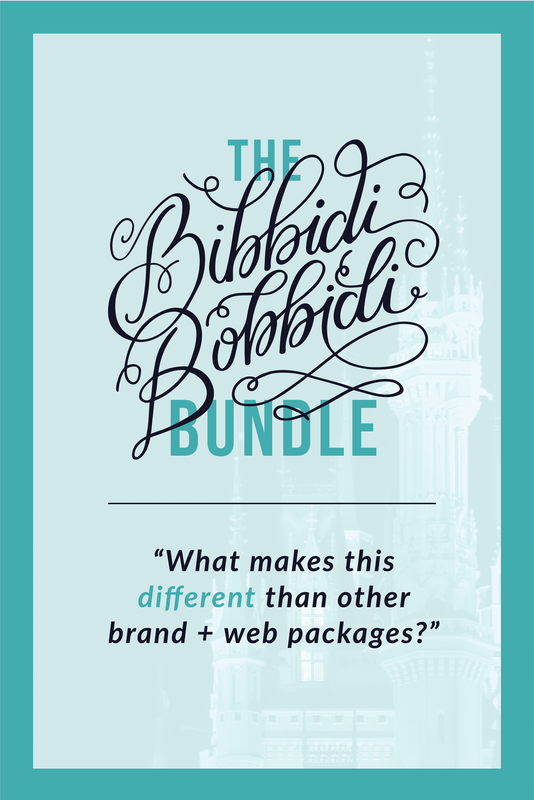 What Makes the Bibbidi Bobbidi Bundle Different From Other Branding and Web Design Packages? I’ve teamed up with Kelly of Star Castle Studio to bring you an all-inclusive brand + web design bundle (the Bibbidi Bobbidi Bundle)! What makes this branding and web design bundle different than other brand and web design packages? LOTS! Watch the live replay or read the blog post below to learn what makes this unique offering so special! This bundle was built on the idea of transparency and collaboration. Kelly is a design and branding expert while I’m a WordPress wizard — together, we walk you through the entire process, from creating the perfect brand all the way through launching your dream website. You’ll work one-on-one with Kelly to fully brand your business and design your website to look (and work) its best! Following approval of your custom page mockups, I’ll bring them to life through robust development prepping you for launch! The transparent access and support of both your designer and developer during this process is something that really sets this bundle apart! Many businesses work with a brand designer first to create their branding and then later down the road hire a developer to build their website. This results in a developer or web designer using your beautifully crafted brand and piecing it together in a way they see fit, completely ignoring the vision the brand designer originally had for your brand. This ends up with what we call a “frankensteined” look. Having ‘to many cooks in the kitchen’ leads to a messy, thrown together site, where it’s clear there have been many different hands on the project. With the Bibbidi Bobbidi Bundle Kelly does all the design, from your branding to the look of your website, which means you get a cohesive visual brand, not one that’s pieced together. And when it’s time for me to touch the project, I keep Kelly’s vision in place and consult her as needed to ensure your website perfectly represents your brand. Our collaborative approach allows us to stay in our individual ‘zone of genius’ so we’re each bringing only our absolute best skills to the table. We are two expert creatives doing what we each love and are absolutely best at. You will know exactly who is working on your project at each stage of the process, with no behind-the-scenes outsourcing or ‘faceless’ developers. Get the best of both worlds with an experienced brand designer and an expert developer transparently working together to make your brand and website the absolute best it can be! We collaborate to make sure every detail works properly and is beautifully branded unique to your business. Our combined brain power brings the best solutions to the table so your site is efficient, well designed, and accomplishes your individual goals. Finally, you’ll have a design and development team you can depend on! We’re not just building a pretty site; we’re building a site that will work for you! Since we’re not designing to a template, we can build your new site to meet all of your goals. It’s similar to when you’re house hunting: you typically have a wish list and you have to find a house that mets most of your criteria… But how much more awesome would it be to custom build a house from scratch? Then you get every single thing you want out of the house! We won’t be squeezing your needs into a predetermined template or theme. We’ll be building your custom site from the ground up to best suit your business and take site visitors on the journey you want. Start from square one with an experienced brand designer to build your complete brand from the ground up! You’ll work with Kelly to understand your brand’s unique values, message and tone to build a strategic brand that emulates exactly what you want to say. You’re not ‘placing an order’ for a website, you’re getting one specially designed for you with your business’s exact wants & needs in mind. Kelly’s unique style guide process also provides tangible touch points like your framed mood board and printed style guide booklet. In-house graphic designers typically have printed brand guidelines on their desks, and it’s important you bring this same consistently to your own brand. As we’re building your custom website, you’ll get unique branded icons created for use on your site! It’s ideal to have the same designer create your brand and brand assets so everything is cohesive, so we make sure that every need is taken care of and beautifully branded for you! These will be key to illustrate your message and elevate your brand to the next level. Once your brand and website mockups are complete, I use my development skills to build your site to match Kelly’s designs. Plus, I make sure the site is easy for you to use and edit. You won’t need a developer on call to make small changes (unless of course you’d rather outsource that!). Your site will be easy to use — no jumping into the code to make changes required! If you can find your way around a WordPress dashboard, you can edit your site! And once your site is live you won’t be “thrown to the wolves” when it comes to managing and up-keeping your new site. After launch, you’ll get access to a video tutorial library that will walk you through all of your site’s features. You’ll know exactly how to make updates and if you forget, you can easily remind yourself! Yay for finally being able to keep your website running smoothly and up-to-date! If you’re currently in the market for a custom designed and developed WordPress site, you know they can easily go for $10K or more — not even including a fully custom brand design along with the site construction. Also, many designers offer web design packages but don’t include the cost of development into their price. This brand and web bundle is less than half the price of typical fully developed site, includes tangible bonuses, expansive brand assets and so much more! Through this bundle, we’ll be taking care of you from start to finish and ensuring you launch with an amazing brand and website you can finally be proud of! Ready for your fabulous new brand + website? Bibbidi Bobbidi Boo, we got you. If you’re ready to lay your brand’s foundation and get serious on prepping for launch, let’s start on this first step together. Answer a short questionnaire telling us more about your dream and start finally making your brand + website dreams come true!